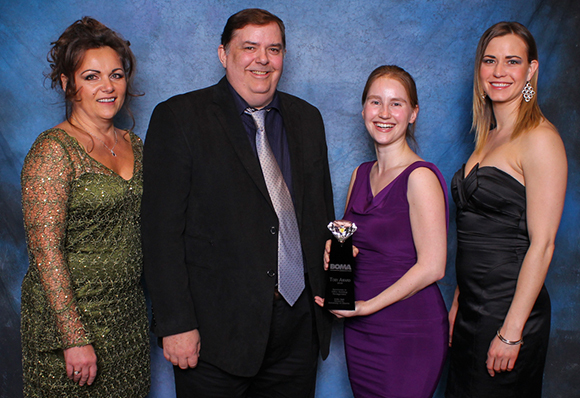 The university's Triffo Hall recently won the 2016 Outstanding Building of the Year (TOBY) Award in the historical building category from Building Owners and Managers Association (BOMA) Edmonton, an internationally recognized award for building management. Originally built in 1915, all areas of the building's operations were carefully evaluated for safety and security, environmental stewardship and community involvement. The building features skylights that run the length of the building and rainwater collection and usage. 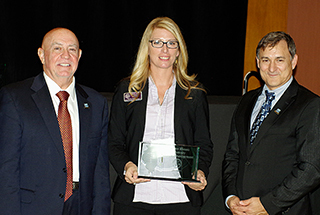 The university received Southface's Fulcrum Award for its WaterHub, an on-site, campus-wide water reclamation system that utilizes an eco-engineered treatment process to recycle nearly two-thirds of campus wastewater for heating, cooling, irrigation and toilet flushing. The Fulcrum Awards is designed to recognize people, programs, buildings, movements and organizations that demonstrate excellence in pursing Southface’s vision: a regenerative economy, responsible resources use and social equity through a healthy built environment for all. 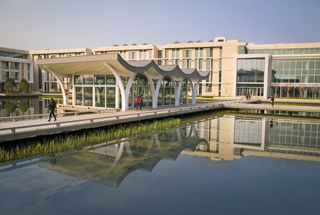 Duke Kunshan University is the first Chinese university campus to be certified by the Leadership in Energy and Environmental Design (LEED) campus program, with all five campus buildings certified by the U.S. Green Building Council. The campus is distinguished by its use of aquatic elements to absorb, store, permeate, purify and reuse rainwater. 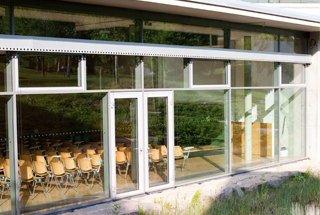 Classrooms are equipped with air filtration and carbon dioxide monitoring and 32 percent of the campus site is covered in oxygen-generating native plants. Buildings make use of natural light to reduce energy consumption, high-efficiency water fixtures and solar thermal collectors. The university will become the first one to join the Carbon Pricing Leadership Coalition. Launched at COP21 in Paris, the Carbon Pricing Leadership Coalition is a private-public partnership that aims to strengthen carbon pricing policies through the development of a network for sharing best practices. Since November 2015, a pilot project has been underway on the Yale campus to test how carbon pricing can inform and guide energy conservation. The university's South Campus Apartments and Student Commons building, now displaying the Gold designation, feature natural light and energy-efficient lighting technology, FSC-certified wood, efficient plumbing fixtures, wind power and native plant landscaping. The university's Athletics Department, which operates 70 buildings on campus, recently completed projects that significantly reduce energy consumption, waste and water including the installation of new HVAC equipment, additional composting and recycling bins, and hand watering turf versus automatic sprinkler use. The university's new Global and International Studies Building features abundant natural light throughout, occupancy and temperature sensors and water saving toilets and sinks. Lawnstarter, a new landscaping startup company based in Austin, Texas, recently identified the 11 "greenest" basketball arenas in the U.S. Lawnstarter gave priority to newly constructed arenas that received LEED Gold status, followed by renovated arenas with LEED Gold status and renovated arenas with LEED Silver status. The LEED scores for the projects, if available, came from the U.S. Green Building Council and the universities. In order of rank, they are University of Texas at Arlington, Towson University, University of Oregon, University of Michigan, George Washington University, University of Toledo, University of Iowa, University of California Los Angeles, University of Notre Dame, Southern Methodist University and University of South Florida. The purpose of the project was to revitalize a high performance space and to create an energy-efficient indoor environment focused on occupant health, resulting in 100 percent of the project's adhesives, paints and flooring systems were low-emitting. 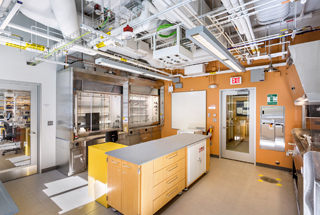 Energy conservation measures include more efficient LED lamps, and lighting sensors and controls to help improve the occupants’ research and time in lab. 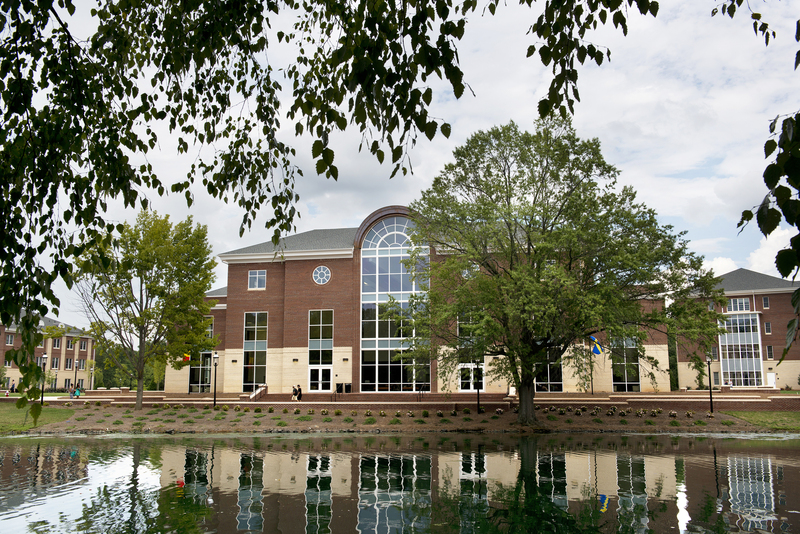 The campus' main administration building is the university's 19th to be LEED certified. It features water-conserving plumbing fixtures, environmentally friendly lamps, energy efficient equipment and construction materials, and adoption of LEED's High-Performance Green Cleaning Program. The university's new Continuing Studies facility features occupancy sensors, a solar array, stormwater management, daylighting and low emissive materials and is the first all-LED lighting building on campus. The university's new Health Sciences Biomedical Research Facility II includes reuse of all moisture generated by the cooling system and non-potable water collected from numerous sites within building for irrigation of outside lawn; all plumbing is low-flow and can use non-potable water; windows are operable and employ both fixed and computer controlled exterior shading; specialized systems and equipment monitor and optimize energy usage in labs; and building materials selected for low emission of volatile organic compounds, with much recycled and locally sourced. 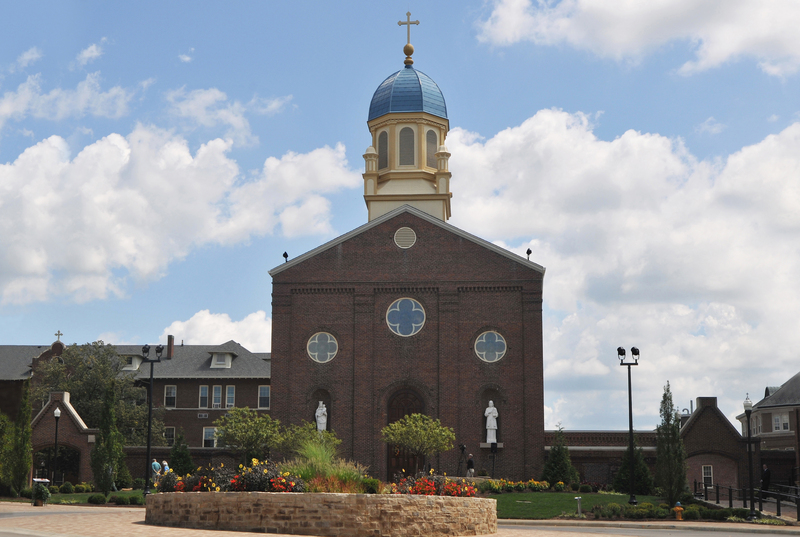 The university's newly renovated 1869 chapel features building materials that were recycled or are low-emitting materials, a plumbing system designed to reduce water consumption by 40 percent, and LED lighting to reduce electric consumption. The university purchased renewable energy credits for two years to offset 70 percent of the building’s energy usage. The university's new 283,000-square-foot Talley Student Union features an open design that maximizes daylight, occupant health and productivity, low-emitting finishes and furniture, high-efficiency plumbing fixtures, a 50,000-gallon rainwater cistern, and energy-efficient HVAC systems. 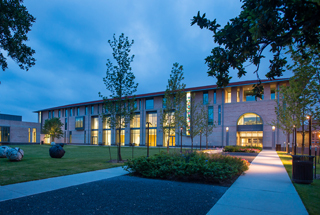 The new renovation of Esteves Hall at the university's Business School makes the 100th LEED certified space on the university's campus. Certified by the Green Parking Council and one of seven such structures in the U.S., the building's features include the operation of environmental controls in this mostly enclosed parking garage. Exhaust air from the building above moves through the garage to moderate the temperature and flushe out carbon monoxide generated by cars in the garage. EV charging stations and LED lights included. 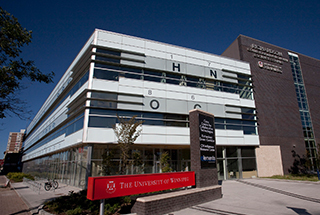 The new home of the university's Nicholas School of the Environment features photovoltaic technology that supplies nine percent of the building's total energy needs, solar thermal panels for domestic hot water, a vegetated roof, 100 percent FSC-certified wood for interior, water recycling systems and 95 percent of construction waste was recycled. 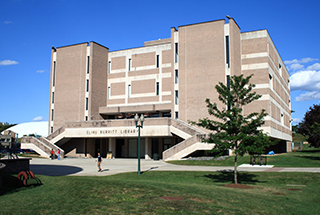 The university's Rubenstein Rare Book and Manuscript Library, dedicated recently following a 2-year restoration/renovation, used more than 20 percent pre- and post-consumer recycled content in materials and recycled more than 75 percent of construction waste. 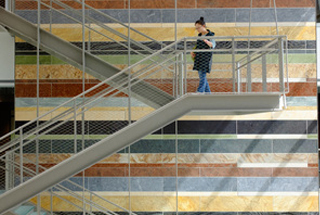 Low-VOC finishes, carpets, and sealants contribute to the building’s indoor air quality. The original building was preserved. Opened in fall 2013, the 230,000-square-foot building features a geothermal-well installation, windows and shades that optimize daylight and energy savings, a vertical wind turbine and rooftop solar panels that tie in to the building, water bottle filling stations, small roof gardens and four stormwater retention basins. 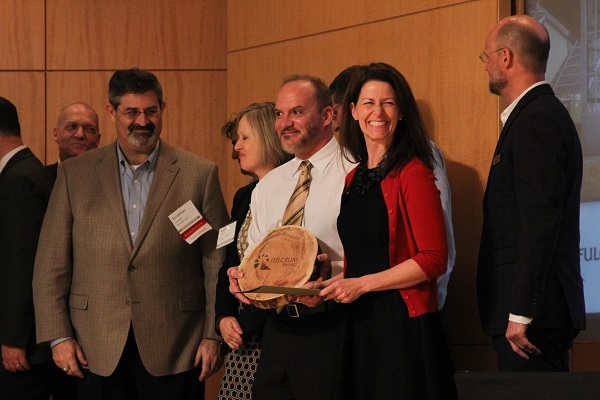 One of 19 companies and organizations that submitted for the award, the university received the 2015 Illinois Governor's Sustainability Award for excellence in environmental performance. 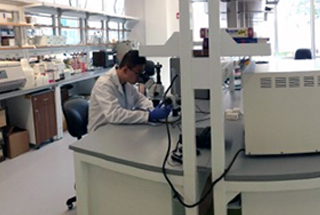 The university's application included sustainability-related projects that staff members in Facilities have undertaken and completed in recent years, as well as on the unit's everyday practices. 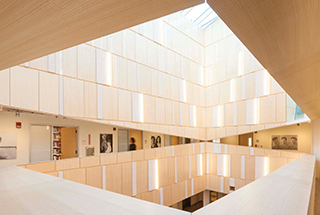 The recent 26,000-square-foot renovation includes a focus on occupant health and indoor environmental air quality by using low chemical emitting building materials and finishes, energy-efficient heating, ventilation and air conditioning systems that use water to heat and cool, occupancy sensors and daylighting. A two-page case study of the university's Sustainable Living Center is being included in a new 160-page electronic book published by the U.N. that seeks to inspire, encourage and support universities to develop and implement their own transformative strategies for establishing green, resource-efficient, and low carbon campuses. 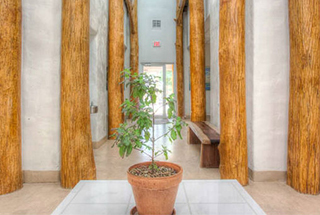 The new building, previously the site of a roller rink, includes an atrium featuring living fig trees and a wooden wall made from the roller rink's wood flooring, natural daylighting, a heat recovery system to aid in energy efficiency, and reclaimed materials. 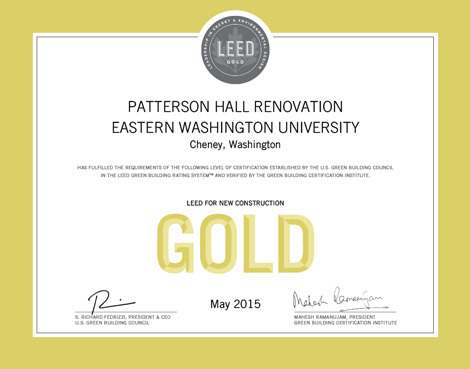 Three university residence halls, opened in August 2014, were recently cloaked with LEED certification. Combined the halls have nearly 400 total student units with more than 900 beds. Students involved in the buildings' planning process stressed LEED as a key component. 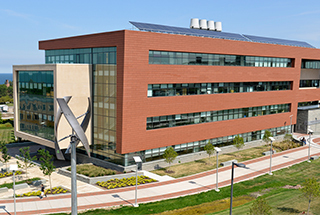 College Avenue Commons, the newest university building used primarily by the Ira A. Fulton Schools of Engineering, features environmental systems monitoring, an orientation that helps minimize the western exposure and adjustable LED lighting. One major goal of the project was to provide a living and learning resource for engineering and construction education. The university's newly redesigned Ehinger Center features a renewable energy system, low-emission paint and recycled construction materials. Other features include an indoor composting station, pervious concrete pavers that allow rainwater to be reabsorbed and waterless urinals in the men’s bathroom. After leading a stakeholder engagement process over the past year and a half, the Energy Department states a Zero Energy Building is “an energy-efficient building where, on a source energy basis, the actual annual delivered energy is less than or equal to the on-site renewable exported energy." The findings were released in the recently published A Common Definition for Zero Energy Buildings. 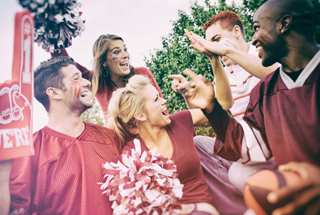 The recent article from University Business highlights the upward trend of colleges and universities that incorporate sustainability into new construction and renovations including energy and water efficiency, aesthetics, monitoring systems and learning opportunities for students. The new $2 million cooperative agreement involving the university's Institute for Sustainable Energy will launch a pilot program called Accelerate Performance that integrates performance-based procurement into new construction or major renovation projects. 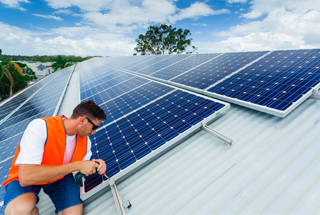 The initiative is funded by the U.S. Department of Energy and includes Seventhwave and the National Renewable Energy Laboratory. The university's newest LEED Gold-certified building utilizes recycled materials, conserves energy and water, manages storm water quality, minimizes the heat island effect and automatically adjusts temperature and lighting to fit the environment outside. 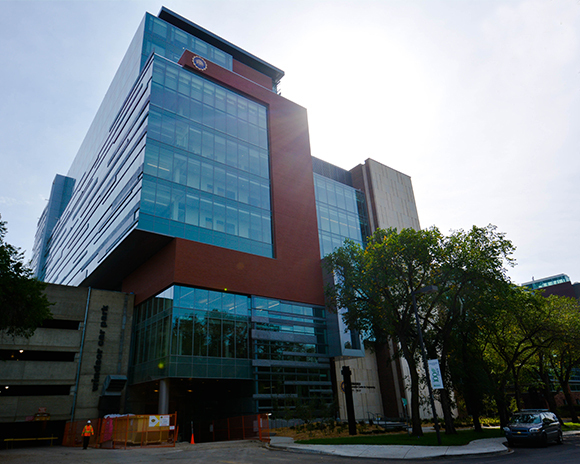 The university's Faculty of Engineering is now housed in the most energy-efficient building on campus and is on track to for LEED Gold certification. The new facility integrates many notable sustainable features including fan wall technology, chilled beam technology, motion-sensor lighting and low-flow fixtures. 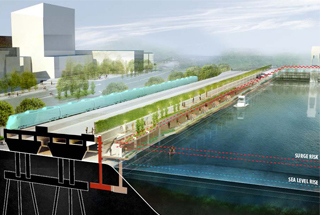 Future plans include installing a 60-kilowatt photovoltaic system. 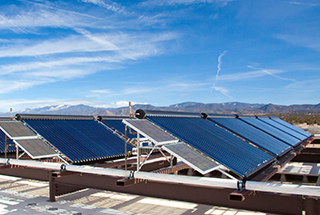 The community college's Trades & Advanced Technology Center building boasts solar thermal and photovoltaic rooftop systems, concentrating solar hot water collectors, rainwater catchment for lavatory use, motion-sensing technology with LED lighting, all wood used is FSC-certified, zero use of refrigerants, and bicycle storage and parking spaces for low-emitting and fuel-efficient vehicles. 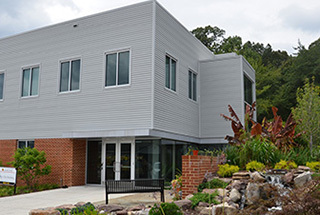 A new campus building that houses the Department of Building and Landscape Maintenance recently achieved LEED Silver certification and a rating of Three Green Globes from the Green Building Initiative rating system. 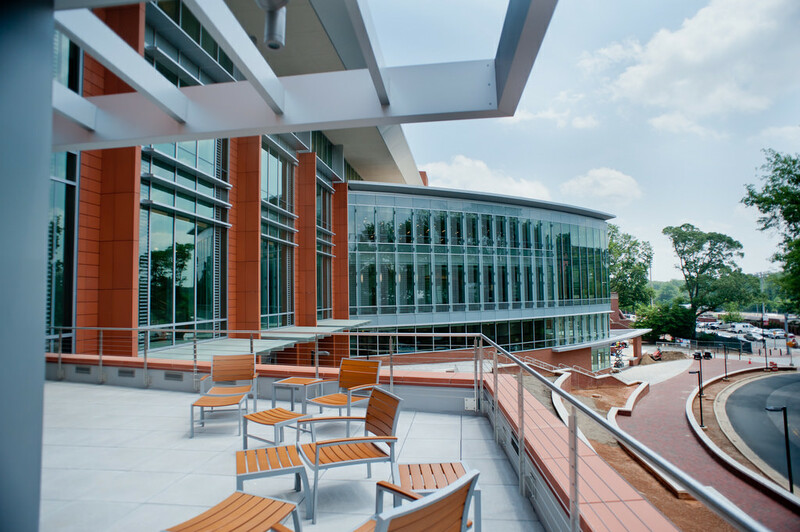 This is the first University of Maryland building to receive dual recognition from both LEED and Green Globes. 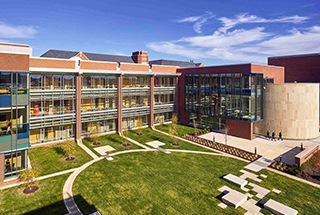 The university's largest academic building, Patterson Hall, now includes a new glass facade for natural lighting, low maintenance landscaping and low environmental impact materials. Aligning with the university’s Cleaning for a Healthy U program, the university’s Buildings and Grounds Services recently announced a new primary custodial services business contract, Avmor, Wesclean Equipment & Cleaning Supplies and BeeClean Building Maintenance, to provide environmentally friendly cleaning products and cleaning equipment. In partnership with the university's Engineering Service Learning course, students will document and certify the campus’ applications for the LEED operations and maintenance program rating system and provide students with the opportunity to take the LEED credentialing examination. As part of a $30.2 million project to replace the university's outdated heating and cooling systems and reduce its impact on the environment, four new chillers are replacing 24 separate building units to provide more efficient cooling. 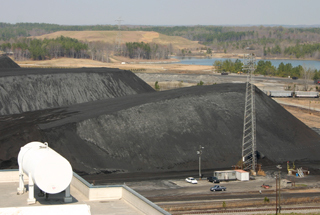 The new system is anticipated to reduce the overall footprint by eight percent. Over the next two years, $17 million will build and upgrade student housing that will be certified under the National Association of Home Builders Green Building program, including building features such as additional insulation, energy-efficient furnaces and appliances, tankless water heaters and airtight windows. After investing over $1.5 million since 2009 on updating lighting controls and adding occupancy sensors across campus, the next step of the university's energy savings initiative is to retrofit outdoor, athletic and theatrical lighting to LED. 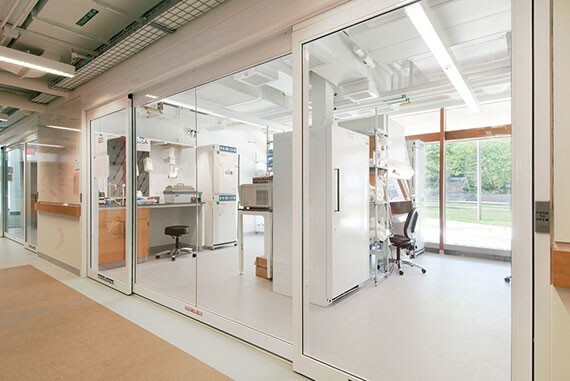 The university's Museum of Comparative Zoology was recently renovated to include lighting and temperature control systems, LED lighting and efficient plumbing fixtures. Located in central North Carolina situated on 620 acres, six buildings in the Global Neighborhood on campus recently received U.S. Green Building Council LEED Silver certification. Five are residential and house a total of 600 students. 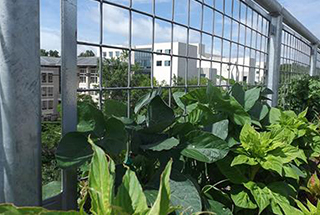 The new 40,000-square-foot vegetated rooftop that produces food replicates the university's 143-acre research farm by using techniques from its sustainable agriculture certificate program. The rooftop also boasts a stormwater harvesting system to collect rainwater in two 500-gallon cisterns.